maybe its the strong architectural design that fits my taste so precisely. but this is just me and my personal taste. Check the Lumion 2011 Competition Winners Announcement Page for full write-up about the winners and the reasones why they were picked, and a selection of many other honorable mention entries. Please have a good long look at these and share your thoughts about it in the comment section below  I think we might have come over a hill (with the marriage of software and hardware) and workflows will start to change. Now excuse me while I go to Lumion a bit! I went over all the other animation uploaded to the competition mix online and I found the GH HOUSE featured in Pavel Huerta‘s entry – How cool is that!!! Ok, so water looks amazing in Lumion! 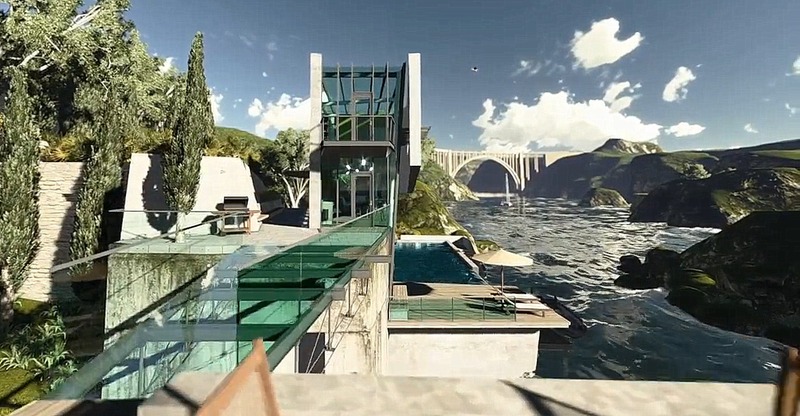 and the third place reminds me a lot of GH House and also Bertrand’s location in the Challenge – on the cliffs edge with the lake / sea sown below. I have to agree – Third place RenderCore studios shows more Balance between Architecture and the Environment – with both interacting with each other. There’s a some sort of presence happening there. First place is great – and big props to Garrett – nice score dude! Third place is great, Ronen, any chance you could contact one of these guys for an insight please? Lumion is looking very promising suddenly, especially in terms of filling in that space between sketchup/revit screen grab and final post-processed image. I’d love to hear more about learning curve/workflow/tips etc. i think lumion is one of the simpliest software i’ve ever seen, a part from the material manager, you cannot move texture as far as i know..
Do you think these videos are post processed in AE? What do you refer to by moving texture – is to changing the tiling on the surface? if so – you can do that. The third place seems to display the relationship between ?human landscape and natural landscape.